While I was gathering every single recipe, one by one, internet blew up with million different Indian recipes. Still I want you to try what I make at home. This recipe of Chicken Masala has been tested many times over and comes out delicious every single time! This is a rustic and hearty version of the Chicken Masala you are used to eating at the restaurant. 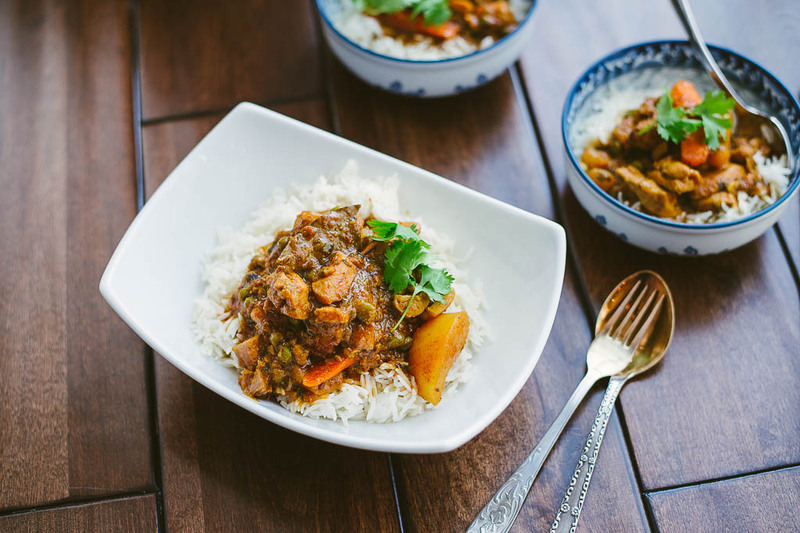 It comes out like a stew but with Indian spices and flavors. Since it is a stew like recipe, you can add pretty much any vegetables you have handy. If you are cooking this recipe in the Instant Pot or a pressure cooker, I want you to be careful with adding nightshade vegetables. Nightshades cook faster than other vegetables and you might end up having a mushier stew. If you are fine with the texture of softer broccoli, go full steam ahead. The recipes I post are meant to trigger your inspiration to flourish. Play with the recipes, see if you can modify them to fit your lifestyle and voila, you have a winner. One thing in this recipe I would like to follow is the combination of spices. While some spices can be swapped with their dry counterparts, I want to ask you not to omit anything. You can certainly add to the ingredient list, though. This dish will give you 323 calories per serving. My servings might be big. If you are watching what you eat, you may need to cut the portion. Honestly though, paired with a salad 323-400 calories per serving is not a bad deal. For the rest of the nutritional information, refer to the bottom of the recipe. Optional vegetables for the stew – 2 potatoes, 1 carrot, 1 cup of frozen peas. 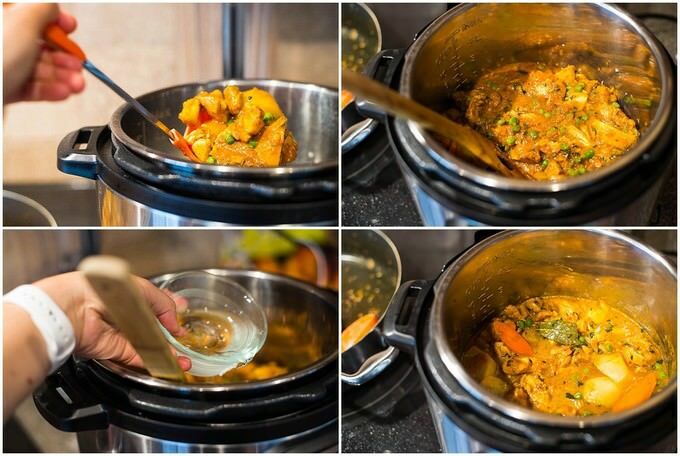 *If you are making this recipe in the Instant Pot and are short in time, you can saute everything lightly (following the order) and seal the lid to cook for 10-15 minutes. However, if you have a little time (5-6 minutes extra), I would take that time to brown the spices and other ingredients. 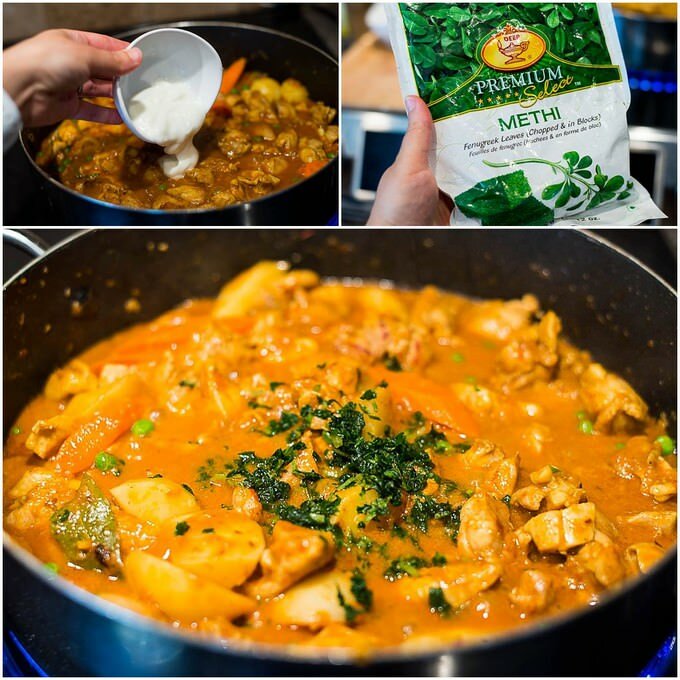 This will increase the taste of this dish and give you phenomenal results. READ this one very carefully: Since you are going to be cooking in the IP with little water, your IP may have a hard time building up enough pressure to seal the lid. The timer might go off, however seal button may not come up. If this happens, please open the vent for a few seconds and close the vent again. Also keep in mind, since you are closing the lid on a hot dish, it is normal for the seal button to pop up right away. This, however, does not mean that enough pressure has built up. Always keep the vent open while closing the lid. Give it 5-10 seconds before you move the vent into CLOSE position. I like to gather all the ingredients to one place, before I start cooking. Especially when I am cooking Indian food, which involves a lot of spices and herbs. I also like to pre-mix all the dry spices I am going to be using. That way you will not need to add all the spices separately. Remember that you will need to fry the spices in oil, so having all of them bunched up in a small container makes it much easier to cook. If you are adding any other vegetables, prep them at this time. I used potatoes, carrots and frozen peas. 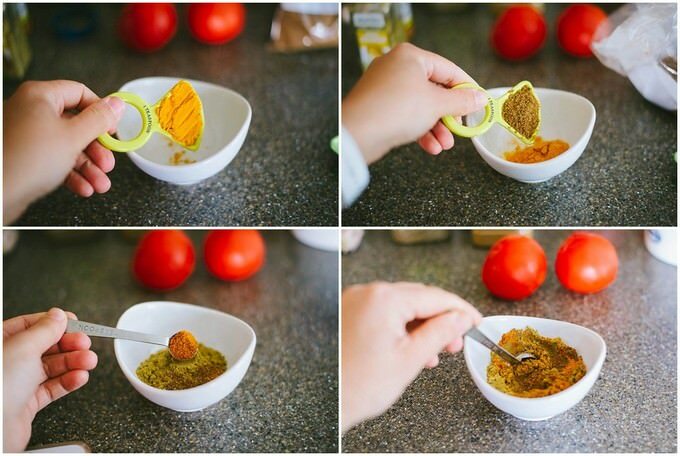 In a small cup add all the dry spices: turmeric, cumin powder, garam masala, chili powder, coriander powder and salt. CUMIN SEEDS do not go into this cup. Mix the above ingredients and set aside. Chop the onion in the chopper, cut up the chicken in small bite size pieces. If you are using a whole chicken, cut it up in smaller pieces. This next step can be done in the Instant Pot, SAUTE function set to 30 minutes. It takes a little longer for my taste. So, I like to fry everything up in a separate skillet and dump everything in the IP once I am done frying. Place the skillet on the stove, add the oils and add the 1 tsp cumin seeds right away. Set the heat to MEDIUM high and wait for cumin seeds to start slightly crackling. This is an indication that the oil is hot enough to cook the rest of the ingredients. immediately add the chopped onion and saute until translucent (takes about 2 minutes). Add minced ginger and chopped garlic. 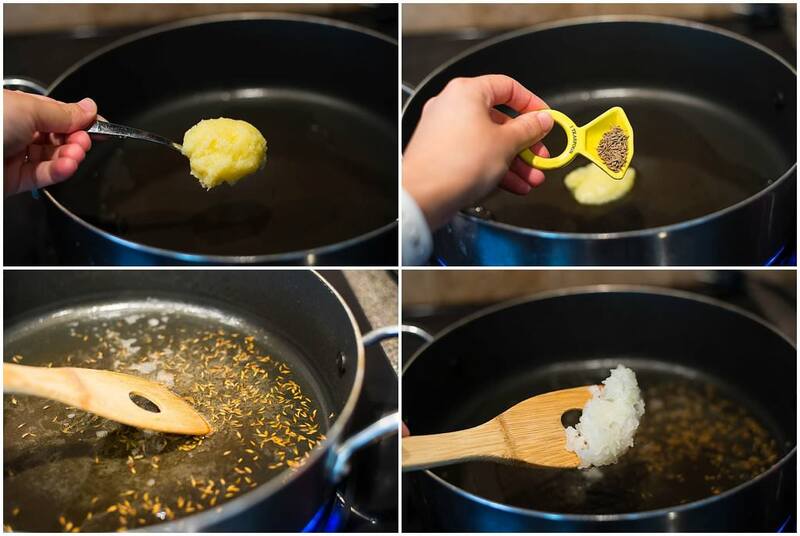 Saute for 1-2 minutes. Add a cup of dried spices and the bay leaf, which you’ve prepared earlier. Saute the spices along with the onion mixture, until the mixture is on a drier side (2 minutes). 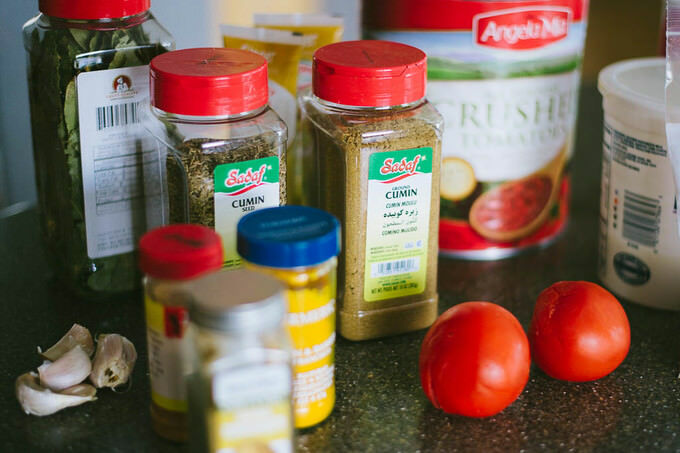 This process infuses the spices and makes your dish delicious. INCREASE the heat to HIGH and add the chicken into the pot. Saute everything together until chicken is no longer pink (5-6 minutes). Add all the vegetables at this point and follow it up with 3 TBSP of crushed tomatoes. Keep on stirring everything together until tomatoes slightly cook down. Add 1 cup of water, 3 TBSP of whisked yogurt and the fenugreek leaves. I buy my leaves from a local Indian store. They are frozen and I use a little bit every time I need them. The rest of the leaves go right back into the freezer. Place the ready mixture into the Instant Pot. If you feel like the mixture is on the drier side, thin it out with a little more water. Make sure that the water does not cover the entire stew. 1/2 cup (or a cup at most, depending how dry your mixture got) of water goes a long way. Close the lid of the Pot, CLOSE the vent and set it to MANUAL mode, HIGH pressure and set the time to 10-15 minutes. Mine cooked in 10 minutes. With all the sautéing done prior, it shouldn’t take any longer. Once the time is up, let the IP (Instant Pot) QUICK RELEASE. Once the steam is out, your chicken is ready to serve. Garnish with cilantro and serve with a side of carbs, be it rice or other vegetables of your choice. Let me introduce you to another gem of a recipe made in Instant Pot. 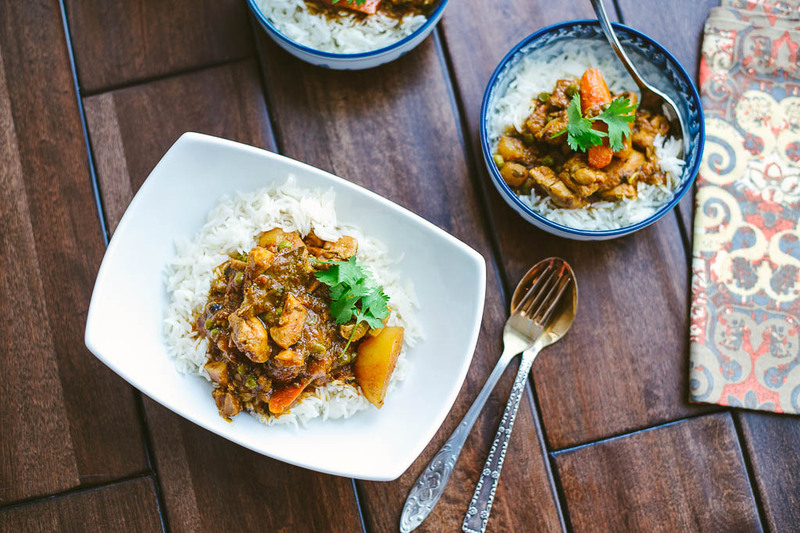 Meet Instant Pot Chicken Masala, you guys! This recipe of Chicken Masala has been tested many times over and comes out delicious every single time! 1 TBSP Ghee optional, but delicious! Optional vegetables for the stew – 2 potatoes 1 carrot, 1 cup of frozen peas. Place the ready mixture into the Instant Pot. If you feel like the mixture is on the drier side, thin it out with a little more water. Make sure that the water does not cover the entire stew. 1/2 cup of water goes a long way. Since it is a stew like recipe, you can add pretty much any vegetables you have handy. If you are cooking this recipe in the Instant Pot or a pressure cooker, I want you to be careful with adding nightshade vegetables. Nightshades cook faster than other vegetables and you might end up having a mushier stew. If you are fine with the texture of softer broccoli, go full steam ahead. The recipes I post are meant to trigger your inspiration to flourish. Play with the recipes, see if you can modify them to fit your lifestyle and voila, you have a winner. One thing in this recipe I would like to follow is the combination of spices. While some spices can be swapped with their dry counterparts, I want to ask you not to omit anything. You can certainly add to the ingredient list, though. This is an amazing recipe. So delicious, I am in love! Thank you for trying this recipe out, Santana! I hope to see you around more often.